With the new Google phone, Samsung Galaxy Nexus the first one to be delivered with Android 4.0 Ice Cream sandwich is on the door- everybody is comparing it with Apple new iPhone 4S. The Galaxy Nexus hardware platform isn't too fast comparing other dual-core Android phones. TI was chosen as the launch silicon partner with its OMAP 4460. The SoC takes a pair of Cortex A9 CPUs running at 1.2GHz and gives them a dual-channel LPDDR2 memory interface to talk to. The GPU is Imagination Technologies' PowerVR SGX 540. The CPU side of things is comparable to Apple's A5, although the cores are clocked noticeably higher than the 800MHz we saw in the iPhone 4S. But the Galaxy Nexus’s true power is its software, brand new Android 4.0 Ice Cream Sandwich. All of the goodness of Honeycomb makes its way to a handset along with even further optimization work. 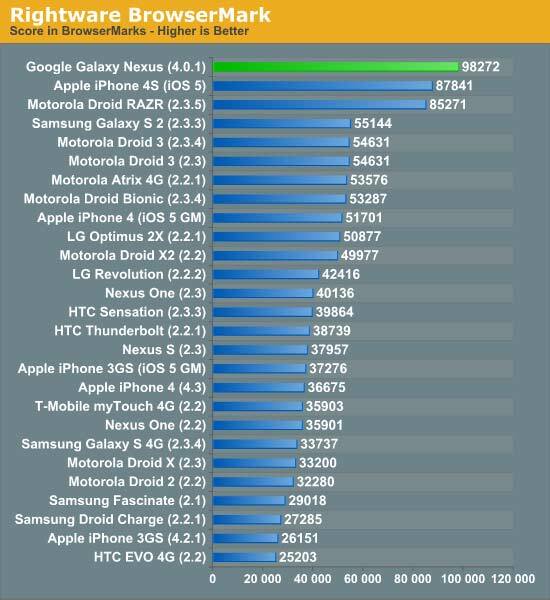 One of the early Galaxy Nexus owners ran the usual browser benchmarks on his phone and shared the results with us. 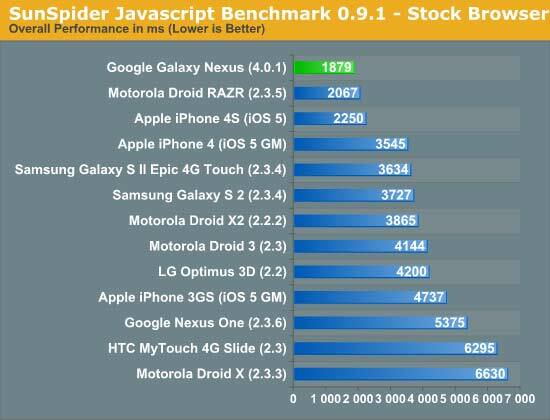 Google has obviously done a lot of browser optimization in ICS as performance is now better than even Honeycomb. And Anandtech is happy to show us the result.